Please contact one of our swarm collectors from the list below who operates in your post code area. Alternatively, go to our contacts page. This is what a swarm of honeybees looks like! Other insects can sometimes be confused with honey bees. Bumble bees, solitary bees, wasps, hornets and hover flies may have similar yellow and brown marking but will not be present in such large numbers as honey bees in a swarm. This is the honey bee. Note the furry body that attracts pollen grains. The bee brushes pollen into the pollen baskets on the back legs and takes it back to the hive. 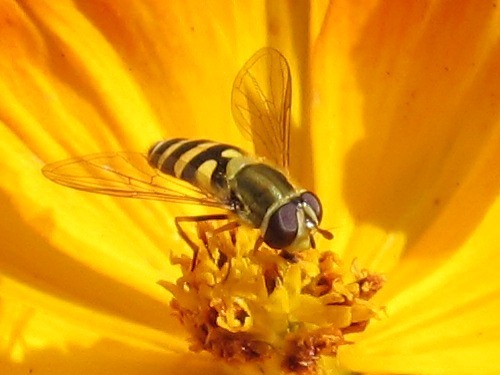 The small yellow and black hoverfly can be mistaken for a bee as it often frequents the same flowers for nectar. A good insect for gardeners as the hoverfly grubs eat greenfly. 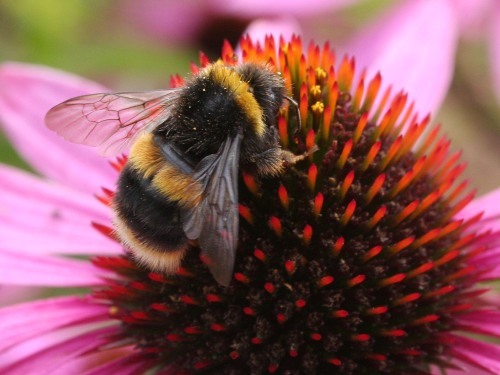 There are twenty-two species of bumble bee in the UK, usually large and furry with distinctive bands of coloured hairs. This one is the white tailed bumblebee. These two queen wasps are feeding on ivy. 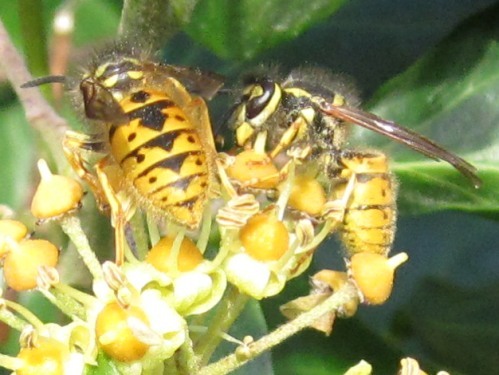 The worker wasps are smaller with similar yellow and black patterns. They can predate on honeybees. 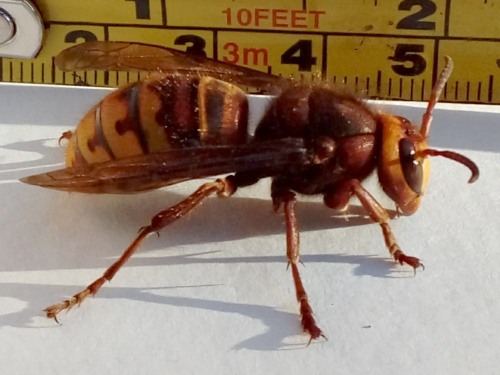 At 3½cm long the European hornet queen is bigger than any similar insect you are likely to see in the UK. The workers are smaller with similar markings. The Asian hornet is not yet established in the UK but may be in the future. Note the yellow legs and the single broad yellow band near the tail. Honey bees do not nest in the ground so insects coming and going from burrows will not be honeybees. See ‘Bees in Nest Boxes’ below. 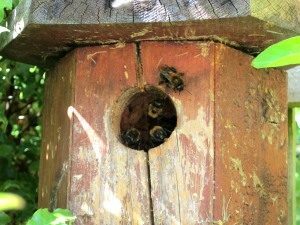 We are increasingly finding bees in nest boxes in East Devon. These bees are more than likely to be Tree Bumblebees (Bombus hypnorum) which are a relatively new species in this area. They are between 10 and 14mm long, have rust / orange coloured hairs on the upper part of the body and a whitish tail. They pollinate all kinds of fruit, flowers and vegetables so, if possible, try to leave well alone.They will vacate the nest box at the end of the season. Swarming is a natural process by which bees multiply their colonies. 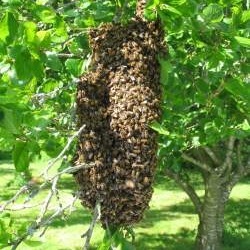 Usually a swarm will emerge from the hive and land on a nearby branch, bush or post, or even under the eaves of a roof, where they will form a large hanging cluster of bees. They will send out a few scout bees, who will look for a new site to build their home. Whilst waiting for the scout bees to complete their task, the swarm is normally docile as all the bees have taken on stores of food for the journey and they need to conserve supplies. The swarm will stay in the cluster for a period of time that may be as short as a few minutes, or may be hours or even days. Finally, when the swarm has decided where its new home will be they will take to the air and fly off in the right direction. If the cluster is within reach then a beekeeper may be able to capture the swarm in a skep or box and take them to an apiary where they can be housed in a hive. Once the swarm has moved off to their new home it may be more difficult to capture them. 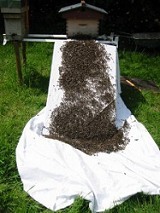 This photo shows a swarm being ‘hived’ by emptying them onto a cloth sloping up to their new front door. Bees will naturally climb upwards and seek a dark cavity. At first all is confusion, then they turn and head up the slope and disappear into the hive! If you’re lucky you may see the queen among the throng. Once the queen has taken up residence you can be fairly certain the swarm will not fly off again. New research has shown that plants can ‘hear’ sounds around them and flowers respond to the buzz of approaching bees by producing sweeter nectar. The research biologists from Tel Aviv University played recordings of flying bee sounds to evening primrose flowers and found that after a few minutes the sugar concentration in the flower’s nectar had increased by 20% on average when compared with flowers left in silence or submitted to higher pitched sounds. 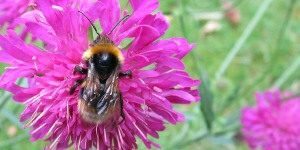 The authors of the report say that, for the first time, they have shown plants can rapidly respond to pollinator sounds in an ecologically relevant way. 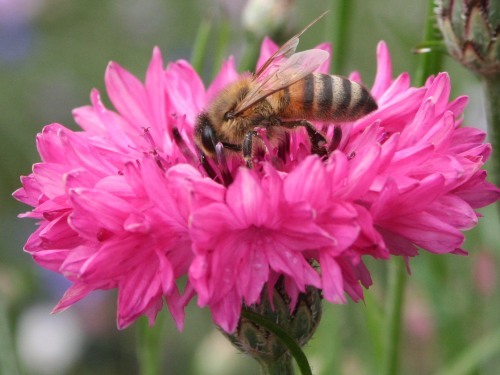 Producing sweeter nectar in response to the sounds of bees can help entice the insects to visit the flowers and increase the chances of its pollen being distributed. Thanks to Ann P. for spotting this article in the Times. Britain’s beekeepers are turning to technology to prevent aggressive Asian hornets destroying their colonies. In a first successful trial, experts at the University of Exeter attached tracking devices to the backs of the voracious hornets and then followed them back to their nests. The June edition of the BBKA News has extensive information about the Asian hornet threat. 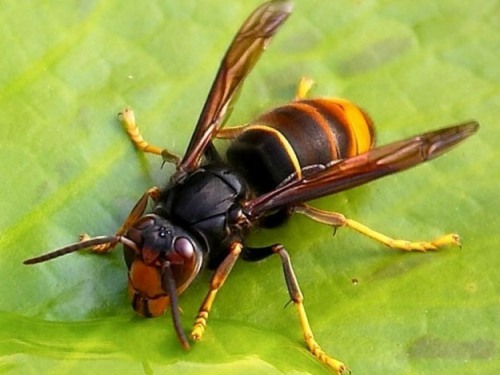 In particular, pages 209 and 210 have full colour reproductions of the Asian hornet alert document issued by the Non Native Species Secretariat (NNSS) for you to cut out and use as your personal guide to identification of this invasive species.